We let this badge define us and our actions. While doing so we lose sight of all the joy and wonder that thrives around us, holding us back from experiencing any further growth. While deep in the throes of our martyrdom, chances are we are the only ones suffering. Our “transgressors” are probably clueless or could care less. How many stories have we heard where person A, years later, confronted person B about person B’s transgression only to realize that person B forgot it even happened or even realized that it hurt person A in any way. We also have this mis-conception that if we forgive someone (or ourselves) it means we’re condoning what they did. In reality what we do when we forgive is really forgiving ourselves for making a decision, more than like unconsciously, to be angry/hateful/etc about this person or situation. And with that decision, we inflicting these negative emotions upon ourselves. A fact is a fact is a fact. Someone does something. That’s a fact. I do something. That’s a fact. How WE react to said “something” is our responsibility, our decision. If we choose to react with anger/hatred/resentment/etc, we subject that upon ourselves, projecting that outward with our words and deeds. If we choose to react from a place of peace/love/joy/etc, we subject that upon ourselves as well, projecting that outward with our words and deeds. It is what it is – we can continue to play the victim card, to continue to abuse ourselves, or we can learn how to see things differently, starting with seeing things from a “just the facts, Jack” perspective. They are doing the best they can – based on their life’s experiences, what they know, and what they understand. Given the same circumstances, we would do the same thing. I am doing the best I can – here too, based on our life’s experiences. Can I do better? yes, of course, certainly. For right now, though, this is the best I can do. Or, back then that was the best I could do. I know differently now. Thank you “for giving” me this opportunity to learn and grow. Thank you “for giving” me this opportunity to love/like/appreciate/etc you again. Thank you “for giving” me this opportunity to love/like/honor/etc myself again. 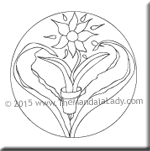 Ponder this (and cut ourselves some slack) as we color this month’s mandala.